This is one of the best Christmas Cookies recipes I have ever found. The Christmas cookies it makes are incredibly delicious. I used small cookie cutters but you can use any shape and size you like. You can choose to melt milk free chocolate but I have never seen white milk free chocolate. Another idea is to dust the biscuits with icing (confectioner's) sugar. Then these will be totally milk free. Using an electric mixer, beat margarine and sugar until light and fluffy, then add egg and beat well. Sift together the flour, cocoa and baking powder, then add to the margarine mixture. Mix to form a soft dough. Place in freezer and freeze for 30 minutes. Preheat oven to 180°C or 160°C fan. Line 2 large trays with baking paper. This is a very soft dough so just use half of the dough leaving the other half in the freezer and roll out between two sheets of non stick baking paper until 5mm thick. 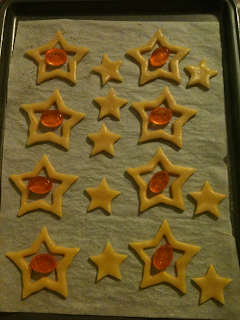 Using small cookie cutters of varying designs or the same if you choose, cut shapes from dough. Re-roll any scraps of pastry. Place on prepared trays, allowing room for spreading. Bake for 10–12 mins, until firm. Cool on trays for 5 mins, then transfer to a wire rack to cool completely. Now what you need to do is place the piece of dough you just used into the freezer and take out the other half roll it out and cut shapes. Then once done place this piece in the freezer and take out the other piece. It is a bit fiddly to do it this way but the dough warms up very quickly and you won't be able to work with it. 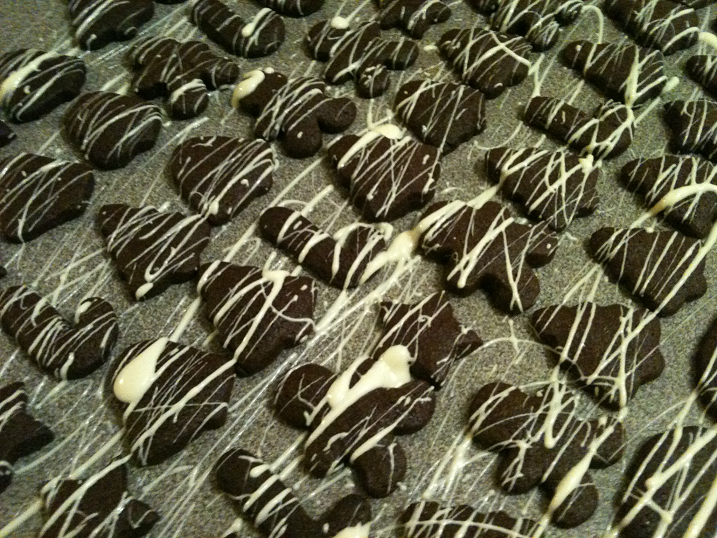 Once the cookies have cooled melt the white chocolate according to the instructions on the packet. Then lay all the cookies out close together and drizzle the chocolate over them with a spoon or if you have a piping bag you can elegantly pipe the white chocolate over them. 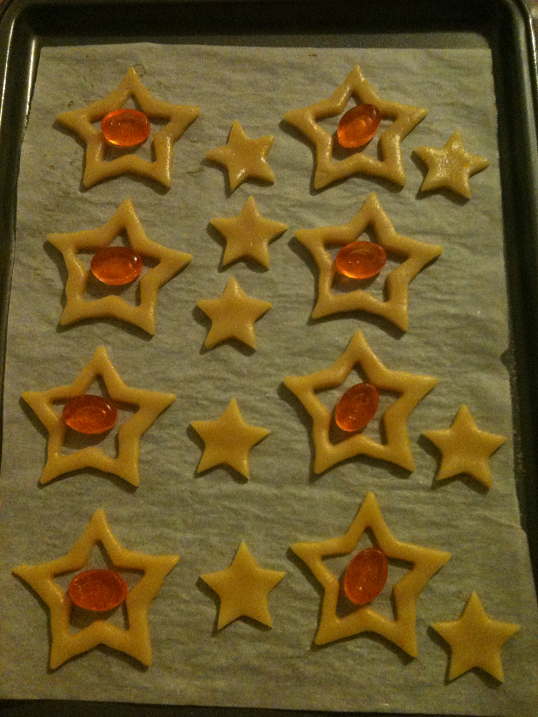 I made 105 cookies with this dough but my Christmas cookie cutters were about 5cm/2 inches long. I was looking for a special treat to make as a birthday cake for a friend and came across this delicious Cherry Tart recipe. This does have butter in it. Not sure if you can substitute margarine in the pastry but you may be able to do it with the filling. Give it a try and let me know how you go. If I was making this for myself I would have substituted all the butter for margarine but as I was making it for someone else I stuck close to the recipe. Place flour in a large bowl. Add butter and use your fingers to rub in until mixture resembles fine breadcrumbs. Add water and mix with a knife until mixture starts to cling together. Gather dough in a ball. Turn out onto a sheet of baking paper and roll out to fit a 35cm x 12 cm loose bottom flan tin. Then remove from paper, but do not throw away, and line tin with pastry. Chill for 20 minutes. Preheat oven to 180C or 160C for fan forced. Line pastry with sheet used above and fill with either baking beans, rice or beans. Bake for 15 minutes then remove beans or rice and cook for a further 15 minutes or until dry and lightly golden. Cool. To make filling use electric beaters to beat butter and sugar until light and creamy. Beat in vanilla paste. Add eggs one at a time, beating well between each addition. Fold in almond meal and flour. 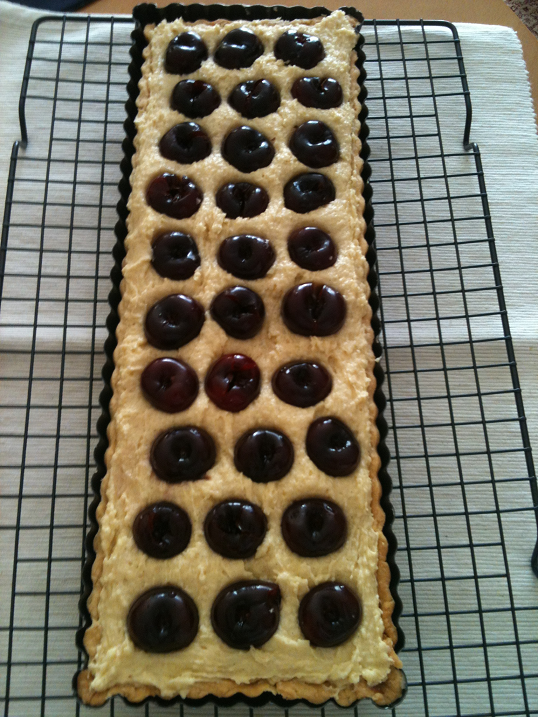 Spread into pastry case. 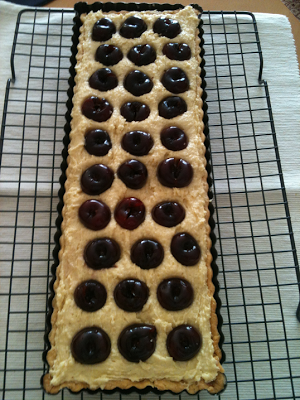 Arrange cherries over the filling pressing in slightly. Bake for 30 minutes or until golden brown. Cool, dust with icing sugar and cut into slices. Serve with cream if desired. 1. 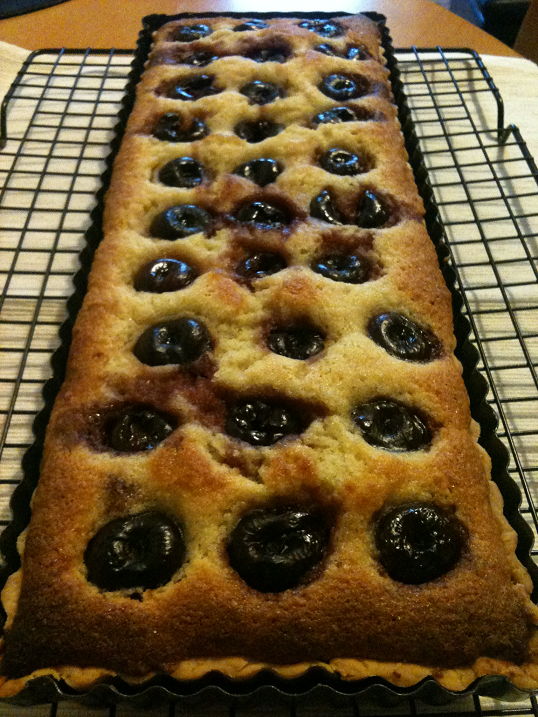 If you can buy a cherry pitter do so! Otherwise you will have to hand pit 45 cherries. I did it with a toothpick and never again! 2. I had a bit of trouble with it not baking in the centre and found that I had to put foil over the dish and put it on a lower shelf for an additional 20 minutes until it cooked through. Keep the oven low and keep your eye on it so it doesn't burn. This recipe for Shimmering Star Christmas Cookies comes from Super Food Ideas Christmas magazine. They are so easy and so much fun to make. If you can find the fruit drop boiled lollies do so. I searched everywhere but could not find them so I used barley sugar lollies. Using an electric mixer, beat butter or margarine and caster sugar until light and fluffy. Add egg. Beat until combined. Stir in flours and custard powder. Knead mixture into a ball and shape into a disc. Wrap in plastic wrap. refrigerate for 30 minutes. Preheat oven to 170C/150C fan forced. Line a few baking trays with baking baking. Roll dough between 2 baking sheets until 5mm thin. 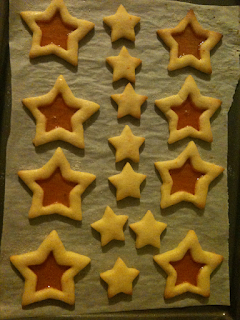 Using a 7.5cm star cutter, cut 1 star shape from dough. Place on prepared tray. Using a 3.5cm star cutter star shaped cutter, cut 1 star from the centre of large star. 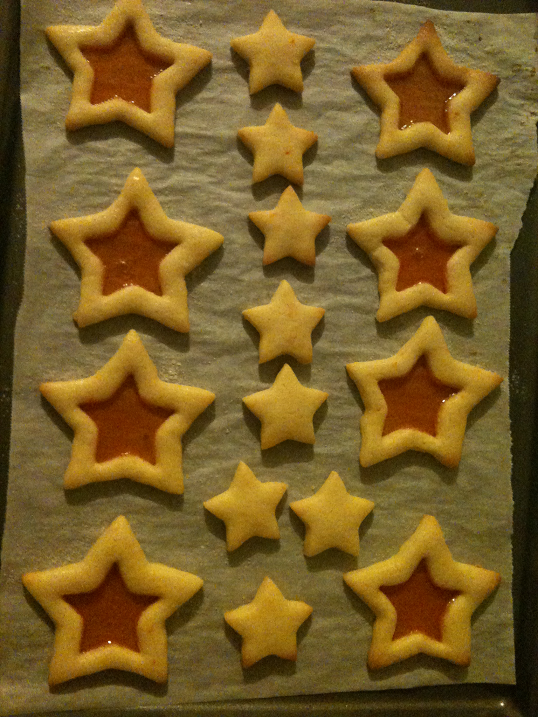 Place small star on tray 3cm apart from large star. Place one unwrapped boiled lolly in the centre of large star. Repeat with remaining dough and lollies, re-rolling scraps. 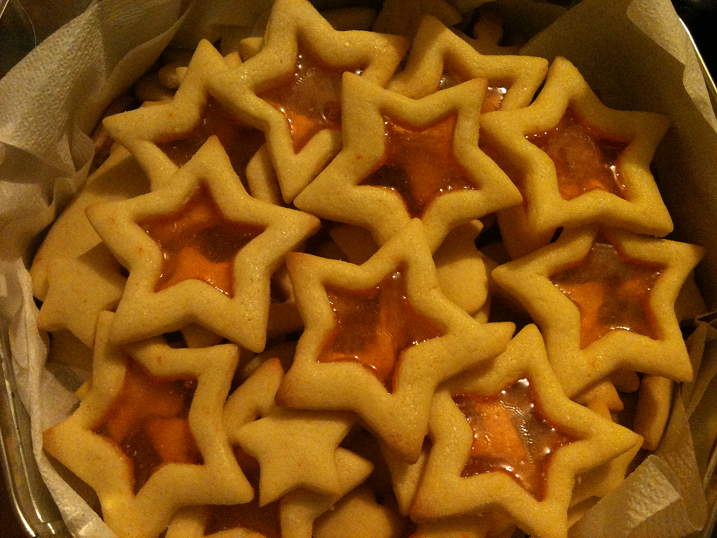 Brush edges of the large stars with cold water then sprinkle with sugar. Bake biscuits one tray at a time for 7-8 minutes or until lollies are melted and biscuits are just firm to touch. Stand on trays for 10 minuted. Transfer to a wire rack to cool. So you ask how to make a Christmas Pudding? I will tell you. 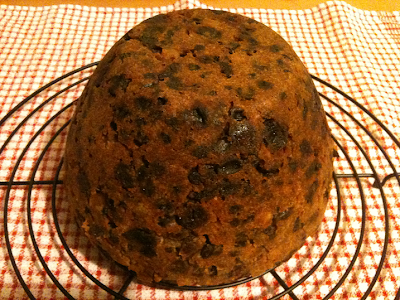 I got this lovely Christmas Pudding recipe from last years Woolworths Fresh magazine. It is a recipe by the doyen of Australian cooking Margaret Fulton. It goes fast so make sure you get one of the first pieces. You don't want to go to all the trouble of making this Christmas Pudding and not end up getting any to eat! Place all fruits and almonds in a large bowl. Sprinkle with rum or brandy and leave overnight. Cream butter until soft add sugar and orange and beat until light and fluffy. Add eggs one at a time, beating well after each addition. Sift flour and spices into a bowl and then fold into butter mixture. Stir in breadcrumbs and fruit mixture until well combined. Grease 8 cup/2 litre pudding tin and line base with a circle of baking paper. Spoon in mixture. Cover top with another circle of baking paper. Cover basin with a large sheet of baking paper with a pleat in the centre to allow for any rising. Tie firmly with string placing a plate on top of the bowl to hold the paper in place while doing this. Make a handle of string from side to side of the bowl latching onto the string around the whole and use to lower the pudding gently into a large saucepan of boiling water. If you have a pudding steamer with handles and a lid skip this step. The water should come halfway up the side of the pudding basin. Cover and steam for 6 hours topping up each hour. Put the pudding on a metal ring or old upturned saucer so pudding does not burn. To flame warm a tablespoon of rum or brandy, light and pour over pudding at the table. Serve with custard.